In our rush to worship at the altar of indulgence we have become heavily dependent on the idle fantasies of mass consumerism. Personal credit allows us to make purchases beyond our income-level. Advertisements subtly reshape our desires around material possessions. And the materialistic culture that surrounds us begins to make excessive consumption appear natural and normal. In the run up to Black Friday, stores have been “leaking” deals since October and teasing you with special online discounts and flash sales. We all know that there is no escaping Black Friday madness, but, why do we buy into the Black Friday hype? Why do we camp out ahead of a doorbuster run or elbow people out of the way so that we can get our hands on the ‘latest’ flat screen TV? 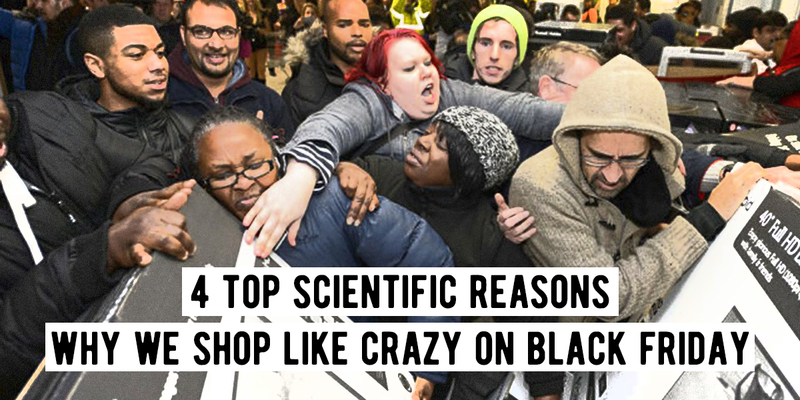 According to two consumer scientists, there are some key reasons why we shop like crazy. James Mourey, assistant professor at the Driehaus College of Business at DePaul University, says that seeing something you like activates the nucleus accumbens – this is central to the brain’s reward centre and makes us feel good. “Any time people shop and they find a great deal, there’s that psychological joy of pleasure,” he said. People are going into debt so that they can have the latest electronics, swiping their credit card for every tablet and flat screen TV they see on sale. What’s funny is that most retailers slowly increase prices before the holiday and then drastically cut them for Black Friday. This means that you’re probably paying the same price as you could have in July. Furthermore, some of the sale items are actually sub-models of their brand counterparts. For example, there are many television models exclusively produced for the holiday season. These are inferior models, which have lesser parts and aren’t built to last and break soon after purchase, but hey, you got a deal right?
? Cozy Off-Grid Home Can Be Built In 6 Hours And Costs Just $33K [VIDEO] What’s On Your Plate? Here’s How The Food You Eat Affects Your Brain ?